We all want evidence, proof. Our legal system is based on it; so is science. Reasonable people think that they base their decisions on available evidence processed through rational thought and reason. In this Sunday’s Gospel, Thomas is one of these people. He wants physical proof from Jesus and Jesus provides it. 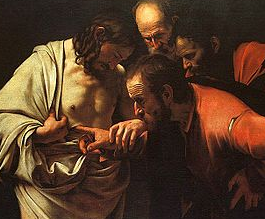 This is the artist Caravaggio’s painting, “the Incredulity of St. Thomas.” This painting is shocking in a way: the contours of the flesh wound in Jesus’ side, Thomas poking his grimy finger into the wound and, in reaction, grasping his own side. The disciples’ curiosity and pushing forward to get their own look, up close. And the artist places the viewer – us — right in the circle with the others who so much want evidence that this is the real Jesus, the same Jesus who died and has reappeared. The tenderness of Jesus is apparent here. He wants to be sure Thomas gets what he needs. He watches patiently, respecting Thomas’ need for physical evidence. This coming Sunday, we will hear John’s take on “Doubting Thomas,” although he should probably be called “Honest Thomas.” He is referred to as “the twin” and he is indeed the sibling of all of us who doubt, and then worry that doubt is not okay with God. Some branches of Christianity teach that it only “faith is Jesus” that gets you into heaven.